Exciting news! 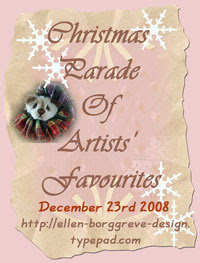 The talented Ellen Borggreve is having a Christmas Parade from her blog on 23rd December 2008. The idea is to promote our "art" and creativity and have a bit of fun drooling over the wonderful creations on display. I do hope you will be able to pop over on the 23rd and have a look.